I can’t believe it is 29th November. Where has the year gone? For myself, too many trips to hospitals, but the realisation that Christmas is just around the corner comes as welcome relief. We will have nine people around our now highly polished old gateleg table, and I am really enjoying searching for different dishes for our Christmas lunch, hence the title above, ‘New Starters for Christmas’. Two of our guests are my cousins from New Zealand, and the rest are family from not far away. But I suddenly realised that I ought to ask the cousins about their food choices, so I sent off an urgent email asking if anyone was a Vegan, Vegetarian or had Food Allergies. And what did they like to drink. The answers came back – No, No and another No. Thank goodness! As for drink, the answers varied from Beer, Some Wine and Brandy and Ginger Ale. Interesting answers! So back I go to trawling cookbooks, food magazines and blogs for new starters for Christmas. Being the main chef for the day, there was one more important and deciding factor. Call it the Chef’s prerogative. I also had to like the dish myself. Here are two new starter recipes I personally like the sound of, and fancy eating over the Christmas period. 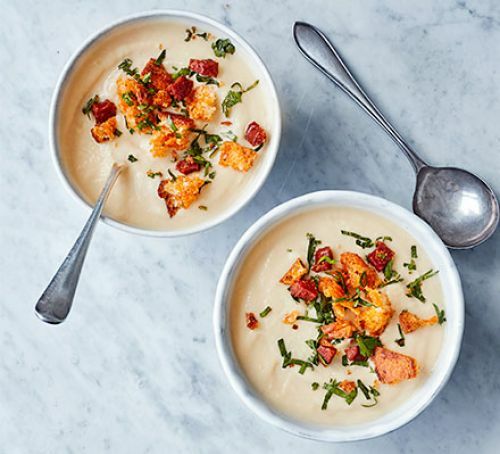 This first recipe is a mixture of two seperate Cauliflower soup recipes taken from Good Food magazine. Heat the butter and 1 tbsp oil in a saucepan over a medium heat. Add the shallots along with a pinch of salt. Cook until soft, about 6 mins, then tip in the cauliflower and potatoes and half the garlic, finely chopped. Give everything a good stir then pour in the milk and stock. Season and cook for 15-20 mins or until the vegetables are tender. Meanwhile, peel the chorizo, then chop into small pieces. Toast the bread slice, then break into bite-sized pieces. Heat the remaining oil in a frying pan, add the chorizo and fry until crisp.Tip in the bread and remaining garlic clove and cook for a minute or so until everything is nicely coated in the chorizo oils. Drain on kitchen paper and set aside. Using a stick blender, blitz the soup with double cream and season to taste. Reheat if necessary, then divide between the bowls. Mix the chopped parsley with the chorizo and croutons and sprinkle generously on the soup. Obviously the recipe above caters for those whose tastes enjoy both chorizo and garlic, but you can easily leave these out if necessary. Recipe No 2 is a much lighter dish, but is perfect for a Christmas Day menu if you don’t want to overfill your guests. Have a look at this dish. 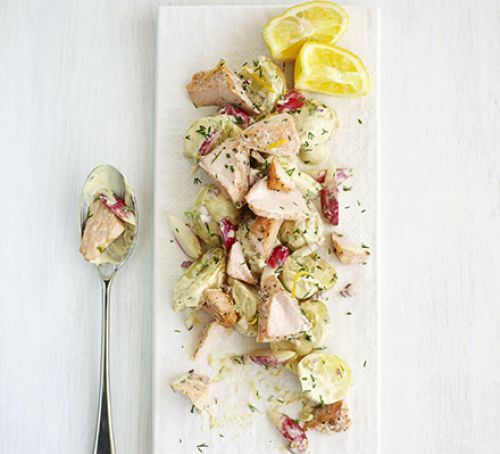 Scandi Salmon Salad – Katy Green courtesy Good Food. This is a light starter for a meal so perfect before a large Christmas dinner. Heat oven to 200C/180C fan/gas6. Boil the potatoes in a large pan of salted water. Bring to the boil and cook for 15 mins until tender. Drain and set aside. If a bit large, cut into bite-sized pieces. Meanwhile, zest the lemon, set the zest aside, and thinly slice half the lemon. Put the salmon on a baking sheet, season and top with the lemon slices. Roast in the oven for 12-15mins, until just cooked through. Leave to cool. Mix together the creme fraiche, dill, parsley, mustard, the reserved lemon zest and one squeeze of the remaining lemon half. Toss together the cooled potatoes with the onion, chopped radishes and the dressing. Gently break the salmon into bite-sized flakes and mix with the potatoes, radishes and dressing. Just before serving squeeze the remaining lemon juice over the salad. Well, that’s two very different new starters for Christmas, to eat either on Christmas Day, or over the Christmas period. One quite substantial and filling Cauliflower Soup with lots of trimmings, the other a light salad, complete with Salmon and a brilliant dressing to stimulate the appetite yet not fill you or your guests up too much. To be honest, I’m not sure which to choose, but I may be tempted to make the Cauliflower soup on a damp, grey December day just to warm myself and Erik up. How about you? 8 Responses to New Starters for Christmas? Now they sound great. I love a cauliflower and we’ve had a great crop this year. I’ll be trying the soup this weekend. That post is making me feel really hungry now, all your posts make me hungry. Will you having these at Christmas? They’re very different. I think I’ll try to be more adventurous this year. Christmas is shaping up at your house I imagine. It was lovely to see you the other day over coffee and chocolate ginger biscuits. It’s food heaven in your engine room. Hi Cecil, Lovely to see you too the other day. You can come anytime especially if you bring those gorgeous biccies. Hi Fabian, what a great name. Looking forward to the cauliflower soup too. Must grow some next year. Regards Astrid.